To all the curry lovers out there, Here is for you a lip smacking recipe of Butter Chicken. Butter Chicken is a Punjabi thick curry, which is yummy to eat with naan(Indian bread),tandoori roti.I love to eat it with rice. Though I love to savour different cuisines but nothing is like home cooked food. 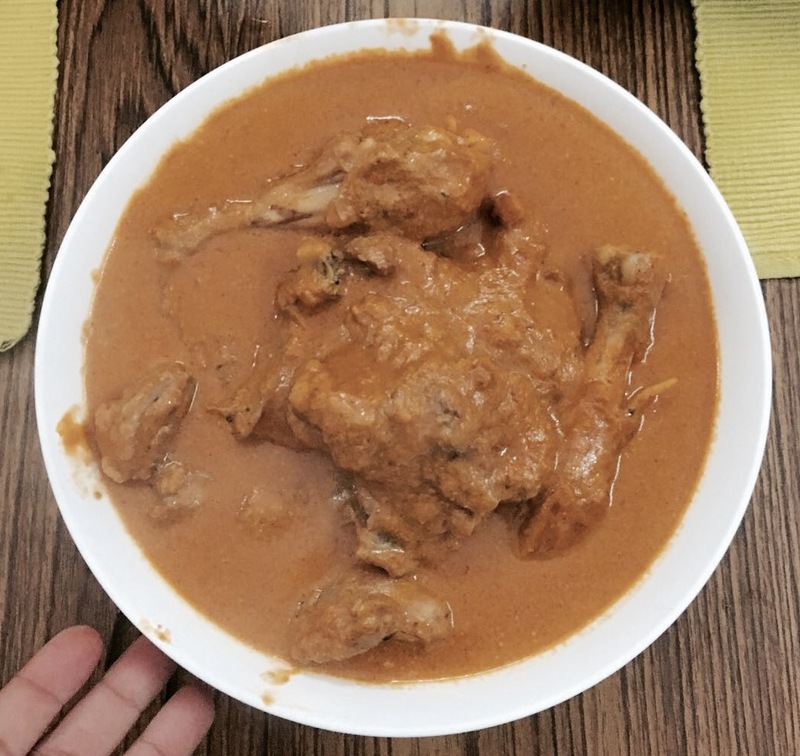 So, this recipe is a improvised version of Butter chicken recipe. Leftover boneless pieces of Tandoori Chicken were mixed with a creamy gravy of tomatoes,that is how Butter Chicken came into existence. But if you don’t have tandoori chicken then what? Don’t worry we will fix that problem. In a bowl, take Chicken,ginger and garlic paste,turmeric powder,chilli powder,coriander powder, garam masala powder and salt. Mix it well. Now, Heat a pan with oil and shallow fry the chicken and keep it aside. Now to give that smokiness to the chicken take a small steel bowl(katori) of ghee (heated) and Burn a cube of coal and put that coal in the bowl(katori) of ghee. Now,keep the fried Chicken in a big bowl and put that bowl(katori)of ghee in that chicken bowl and put a lid to the big bowl. The fumes from coal will get mixed to the chicken and will give the smokiness to it. Take blanched tomatoes and clove of garlic,cashews grind them well and strain the mixture. Now heat the same pan in which you just fried the Chicken(so that the remains of the chicken, oil and spices will get mixed with the gravy that we will make). Now, Put butter to the pan(be generous😋) and add that purie of tomatoes to the pan. Add all spices and sugar to the gravy. Now pour water and put the lid. After 5-6 min add cream to it.Add sliced green chilli.To give it that red colour to the gravy you can add red food color to it. Cook it for few mins till you get that thick curry.To enhance the flavour add tomato Ketchup,then add chicken. After 6-7min put the flame off. One last ingredient without which the recipe is incomplete is lots of love😍😍😍. And the yummy butter chicken is ready to eat.